Editor’s Note: This is the inside story of the “The Final Days of Joseph Ejercito Estrada”which is the title of the diary of former Executive Secretary Edgardo Angara. Angara made the diaries exclusively available to the INQUIRER. 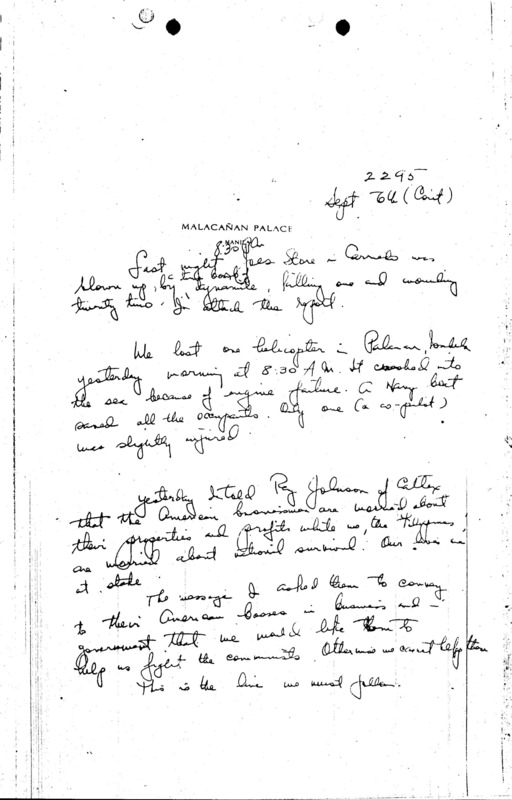 His narrative contains a detailed account of events inside Malacañang during Estrada’s last two days in office. It is an insider’s account of how and why the negotiations for the resignation collapsed, leaving a constitutional ambiguity which is now the basis for a legal challenge, staged by Estrada’s supporters, against the legal legitimacy of the Macapagal government. Angara’s account is incorporated in a book the Inquirer is publishing on the fall of the Estrada government. The book, whose principal author is Amando Doronila, contains a comprehensive assessment of the reasons behind the collapse of the government and inside stories of the events during the five days of People Power II. IT WAS 9:30 in the morning, Jan. 20, 2001. I was inside the Presidential Residence, tired and weary from a night of negotiations for Joseph Ejercito Estrada. The residence looked cool and tranquil, as it had been for many months that I had been its visitor. Very few people were moving around the first floor of the residence. My senior Deputy Executive Secretary, Ramon ‘Dondon’ Bagatsing, was seated at one of the round tables. The head of the Presidential Management Staff, Ma. Celia ‘Macel’ Fernandez, was busy at the computer. Only 13 days ago, I took my oath as executive secretary on Jan 6, 2001 to work with the 13th President of the Philippines. And the 13th day lasted two days. When I made the difficult decision to accept the position of executive secretary, only two things were clear in my mind and heart. One, I would serve our country with all my energy, ensuring that government would always be there for our countrymen. But more importantly, I knew that this was a job that I would perform to the best of my capacities- till the end. Certainly, it was this disposition that carried me through those final days, those final hours, and gave me the opportunity to witness history unfolding. Page breaks indicate when the part published has concluded. Italicized ‘Editor’s Notes’ are part of the texts themselves. Footnotes are my comments. Posted on January 17, 2001 May 18, 2018 Author Manuel L. Quezon IIICategories Diary of Edgardo J. AngaraTags Edgardo J. Angara, Joseph Ejercito Estrada, Ma. 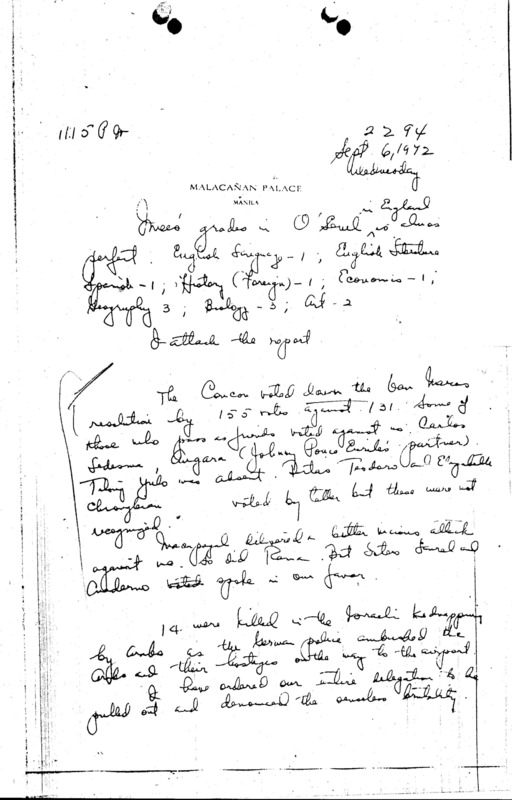 Celia Fernandez, Malacañan Palace, Ramon Bagatsing Jr.
Imee’s grades in ‘O’ level in England is almost perfect. English Language –1 ; English Literature; Spanish –1 ; History (Foreign) –1 ; Economics –1 ; Geography 3 ; Biology –3 ; Art –2 . 14 were killed in the Israeli kidnapping by Arabs as the German police ambushed the Arabs and their hostages on the way to the airport. I have ordered our entire delegation to be pulled out and denounced the senseless brutality. Last night 8:30 PM Joes Store in Carredo was blown up, by a time bomb of dynamite, killing one and wounding twenty two. I attach the report. We lost one helicopter in Palanan, Isabela yesterday morning at 8:30 AM. It crashed into the sea because of engine failure. A Navy boat saved all the occupants. Only one (a co-pilot) was slightly injured. Yesterday I told Rey Johnson of Caltex that the American businessmen are worried about their properties and profits while we, the Filipinos are worried about national survival. Our lives are at stake. The message I asked them to convey to their American bosses in business and in government that we would like them to help us fight the communists. Otherwise we cannot help them. This is the line we must follow.